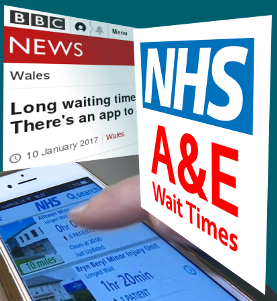 This project was to produce a mobile phone app for Android and iOS that shows live waiting times in local hospitals and walk in centres. The intention is to allow the patient to make an informed choice regarding which of their local sites to visit. The app allows the user to search for sites by postcode, device location or locality. As well as waiting times it also shows information such as opening times, treatments available and parking facilities at each site. A news feed is also shown relevant to the sites selected. The app is integrated to the phones navigation system for turn by turn navigation to the site car-park. The system comprises of the app itself which is developed using PhoneGap (which is based on Apache Cordova), a server application that provides information to the app and a maintenance web application so the site information can be maintained. The actual wait-times are either sent automatically via a web service to the server application, or they can be manually updated using the administration system. Once at the server application they can be fetched by the app via a REST web request which deliverers the result in JSON format. The administration system has a flexible authentication system which manages the user access depending on role. I devised a tagging system for news item selection. This ensures that only content that is relevant to the sites or localities the user is interested in is shown on the app. The app is available on the Android and iPhone stores. It currently has 20 Hospital and Walk-in centre sites available and I hope the owners (University Hospitals of North Midlands) will be adding more in the near future.